Everyone wants to make a good impression on their new employer. To say that Jhoan Duran made a strong first impression with his Cedar Rapids teammates and members of the Twins organization might be an understatement. The hard-throwing right-hander acquired over the weekend from Arizona in the Eduardo Escobar trade was at his best on Monday night. His battery mate was 2017 draft pick Ryan Jeffers, and he had a breakout game for the Kernels as well. But there was strong pitching throughout the Twins system on Monday, from Rochester to Chattanooga and Cedar Rapids. At the big league level, the Twins traded LHP Zach Duke to the Seattle Mariners in exchange for two minor leaguers, RHP Chase De Jong and IF Ryan Costello. Addison Reed’s rehab with the Red Wings is complete and he has been reinstated to the Twins roster. Also, the Twins traded RHP Lance Lynn to the New York Yankees in exchange for 1B/OF Tyler Austin and RHP Luis Rijo. Austin was in Rochester with Scranton/Wilkes Barre, though he was scratched from the game. RHP Ryne Harper has been promoted from Chattanooga to Rochester. He spent some time with the Red Wings earlier in the season. Twins Daily has also been able to confirm that RHP Tyler Wells has been promoted to AA Chattanooga, though the move won’t be made official until Tuesday. OF Tyler Webb was returned from Elizabethton to the GCL Twins. 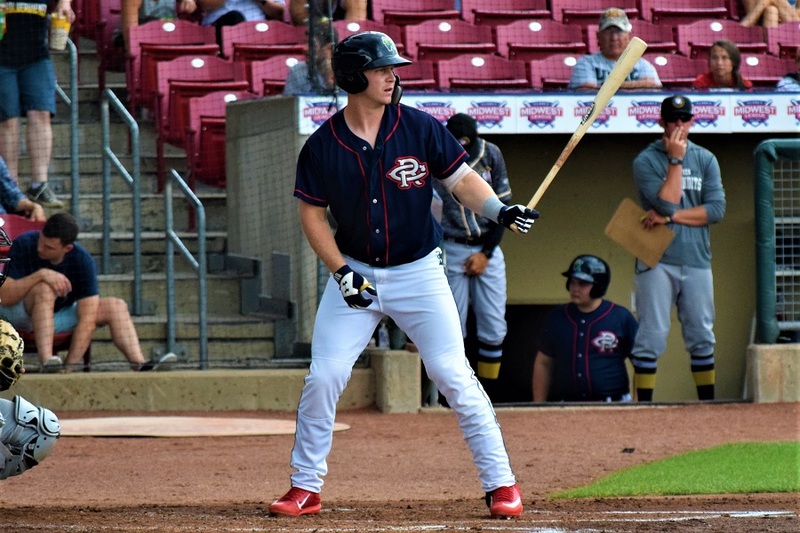 Along with being named the Southern League Player of the Week honors, Brent Rooker was also named the Twins Minor League Hitter of the Week for the third time this season. He hit .467 with four doubles,, three homers and nine RBI. Got on base 55.6% of the time in his seven games. Donny Breek was named the Twins Minor League Pitcher of the Week. The 18-year-old from The Netherlands made two starts in the GCL and went 1-0 with a 0.00 ERA in nine innings. He gave up just three hits, walked four and struck out 13 batters. This game started way back on June 24th, but it rained and was suspended until today. It ended in dramatic fashion at home plate on Monday. Dietrich Enns started and went four innings back in June. He gave up four runs on five hits and three walks. When action started again on Monday, Tyler Duffey took the mound. The right-hander threw four scoreless innings and gave up just one hit. He walked one and struck out three batters. Luke Bard worked the ninth inning and walked one and struck out one. While Enns is no longer with the Red Wings, neither is Jake Cave who homered in the first inning of this game in June. Also, Wynston Sawyer started behind the plate and was replaced by Cameron Rupp who has since been released. Finally, Zack Granite started in left field, but he is currently on the disabled list. The RailRiders had five of their starters who are no longer with the team as well. The beauty of a suspended game. On this day, Willians Astudillo hit a solo home run. Down 4-2 going into the bottom of the ninth, Kennys Vargas walked. Edgar Corcino came to the plate as a pinch-hitter and delivered with an RBI double. Tommy Kahnle came on and Gregorio Petit greeted him with a single to left, but Corcino was thrown out at the plate to end the game. New Twins 1B/OF was scratched from the Scranton/Wilkes Barre roster, and as you now know, traded. All he had to do was walk over to the other dugout. However, when this game started back in late June, Austin had hit a home run for the RailRiders. Kohl Stewart and Chance Adams put together a pretty impressive pitcher’s duel in this game. Stewart threw seven shutout innings. He gave up just three hits, walked one and struck out four batters. Adams, however, had a no-hitter going until the seventh inning when Gregorio Petit broke it up with a single to start the seventh, but the team was unable to break the scoreless tie. Nick Anderson struck out one in a scoreless eighth inning. Adams went back out for the bottom of the eighth. With one out in the inning, and the automatic runner (Taylor Motter) at third base after a ground out to first base, two batters were intentionally walked to load the bases. Joel Skinner had Jeremy Hazelbaker pinch hit for Byron Buxton (who was 0-for-3 with three strikeouts), and Hazelbaker singled in Motter with the winning run. It was just the second hit of the game for the Red Wings. Four pitchers combined for the Lookouts to shut out Tennessee 3-0. Williams Ramirez went the first two innings. Sean Poppen came on and went the next five innings. Then Tyler Jay and Cody Stashak each threw a scoreless inning to finish the job. The Lookouts scored all three of their runs in the third inning. Jordan Gore started the inning with a single. He scored on a Tanner English double. English then scored on a single by Zander Wiel. Later in the inning, Chris Paul knocked in the third run with a single to score Brent Rooker, who had walked. English led the offense with two doubles. He now has 13 doubles on the season. Mitchell Kranson also had two hits in the game. You never get a second chance to make a first impression. At least that’s what “they” say. Well, if it’s true, then Jhoan Duran made about as strong of a first impression that a 20-year-old starting pitcher can make in a new minor league system. Duran came to the Twins organization over the weekend from the Diamondbacks in the Eduardo Escobar trade. On this night, he threw seven no-hit, one-walk innings. He struck out eight batters and really didn’t have much struggle on the night. Jared Finkel kept the no-hitter alive through the eighth inning. However, with two outs in the ninth inning, he gave up a solid single between third base and the shortstop. One batter later, the Kernels settled for a one-hit shutout. Duran got plenty of offense in support, but their number three and number four hitters led the way. Jose Miranda batted third. He got the team off to a fast start in the first inning with a three-run homer, his 12th of the season. In his next at-bat, he added an RBI single, and in his third at bat, an RBI double. He went 3-for-5. The double was his 22nd of the year. Beyond catching the one-hitter, cleanup hitting Ryan Jeffers came into the game having just two hits in his first five games (19 at- bats). In this game, he went 4-for-4 with a walk, his first three doubles, his first home run and three RBI. Michael Davis went 2-for-4 with his second Kernels double. The Twins got a terrific start from Prelander Berroa. The right-hander gave up just three hits over the first five innings. He walked one and struck out four to earn his first win. Dylan Stowell was credited with a save. He struck out two batters in a scoreless inning. The offense wasn't as impressive, but it was just enough. 2017 ninth-round pick Willie Joe Garry, Jr., singled in Kidany Salva with the game’s lone run. Garry also stole his fourth base of the season. Gabe Snyder, a 2017 21st-round pick, had the only other hit, his sixth double. Also, big Congratulations to GCL Twins manager Dan Ramsay who became a father for the third time over the weekend. He and his wife named the baby Carew. Twins Daily Hitter of the Day: Ryan Jeffers, Cedar Rapids Kernels (4-4, BB, 3-2B, HR, 3 RBI). #6 - Trevor Larnach (Elizabethton) - No Game Scheduled. #15 - Ben Rortvedt (Ft. Myers) - Rained out. Please feel free to ask any questions about Monday games, or ask any questions you may have. What happened to Alcala? Is he out for long? So, the 4 teams playing TONIGHT gave up 0 runs? Wow- what organization can say that? Pinch hit for in a AAA game. Sigh. but Stewart, he's going to pitch in the majors. Yeah, not sure the org wants that to happen. Says a lot at this point about where Buxton is with the bat. It absolutely was the right thing to do in the game. I don't know what the organization might think, but they need to get Buxton fixed... maybe he needs to go to Ft. Myers... If he's healthy, he can maybe experience some success again down there and then move backup. 2018 is now all about getting Buxton right,wherever that is. Strained trapezius...the big muscle behind the shoulder. Trapezius strain. nothing serious, but likely done for year. Maybe will make a couple starts at the end of August. 4+ games, no runs scored on minor league Twins pitchers today. Can't remember ever seeing that. I would hope the org is OK with this. (And realize you’re not saying they shouldn’t be.) The concessions to development of putting Buxton in a AAA lineup...and as a lead off hitter no less...already having been made, Skinner decided to use Buxton’s fourth at-bat to try to win the game. If the organization doesn’t want even that type of move/decision to occur with Buxton, it would be much fairer to Rochester players and manager...and better for Buxton as well...if the Twins moved him to a level where his bat making solid contact with the ball is more than a random accident. Nice start for Jhoan Duran! 7 no hit innings with 8k’s and 1 walk, that’s pretty awesome. Hopefully he’ll develop well and be a bigger prospect for us in the coming years along with Graterol and Enlow. This week is kind of like waking up on Christmas morning with lots of presents under the Christmas tree.Probably should thank Santa Falvine for all these new toys.Watching all these new prospects is sure going to make the next month interesting. Great seeing Jeffers with that big game last night.Looked at Miranda's numbers the last ten games.Not only is he on fire, he has walked (4) more times than he struck out (3). Um, the Twins? Or is this a trick question? Buxton is one of the saddest stories I have seen with the Twins.How did he get so lost? The concussions. He's lost the elite visual skills necessary to read pitches. It takes a long time for the brain circuitry to re-wire, if ever. Mauer still isn't the same, though it's difficult to separate normal aging from trauma. That's my working hypothesis. I don’t know. But Buxton has to dedicate himself in the off season to improve his hitting. I’m sure with a little help he could find someone who could work with him in the off season to improve his swing and help gain his confidence. So, theoretically, could Austin have hit a home run for both teams in the same game? A skill not often mentioned in any sport is protecting yourself. You can't play or play well if your not on the field. His reckless play is fun to watch but had clearly cost him overall. Rooker's K-rate is under 25% in July .... Hope he can keep that up in August as well. Yet, his playing defense had nothing to do with this year's injuries.The migraine is something he lives with.Then he fouled a ball off his toe.And his last hand injury came while at bat, didn't it?Nothing reckless with any of these. The return for Escobar doesn't look underwhelming this AM. I would guess he needs to keep up what he did in July to maybe see a week at Rochester at the end of August. If we go SSS just back to July 18 (basically the second half of the month), then he's at a 14.5% K-Rate along with a 19.3% BB-Rate.If he kept that up through August along with the rate of power stats, I wouldn't think a September call-up would be out of the question.Of course, there are other factors like the 40-man move and any defensive improvements that he needs to make. Disagree. The org wants Buxton to get as many at-bats as possible. He hasn't even had 190 at-bats combined yet this season. I can't imagine having him get pinch hit for helps his confidence at all, either. He got 40 at bats to start the season then out for 10 days for migraines. Then he got 4 at bats and then missed 19 days because of his foot. Then 50 at bats before another three weeks to the DL. Then 80 at at bats before missing another 19 days or so. Now he's had all of 8 plate appearances since his most recent comeback. He really needs to stay healthy but he needs at-bats. I don't think the org cares if Rochester wins or not. They need Buxton to get it going and benching him isn't going to do it. I had no issues with pinch hitting at that spot, and I'm a development first guy. I just hope Byron gets healthy again. Then hits some again. For his sake more than ours.